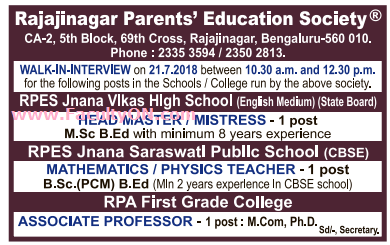 RPA First Grade College, Bangalore has advertised in the DECCAN HERALD newspaper for the recruitment of Associate Professor jobs vacancies. Interested and eligible job aspirants are requested to walk-in on 21st July 2018. Check out further more details below. College Profile: Our purpose is to stimulate and emphasise the importance of education in order to bring out completeness in each and every student. The college has been producing good results and has an excellent track record. The college management and staff are committed towards the overall excellence of students in academics, sports and cultural activities. The college has well established infrastructure in the form of building, laboratories, equipments, library, auditorium, hostels etc. How to Apply: Interested and eligible candidates are requested to attend the Walk-in interview along with Bio-data, originals & copies of certificates / experience certificates and recent PP size photographs to the following walk-in address.